Welcome to our current buying guide to the best Convertible Laptop and Tablet 2-In-1’s out there, based on expert reviews, customer feedback and intensive product research. 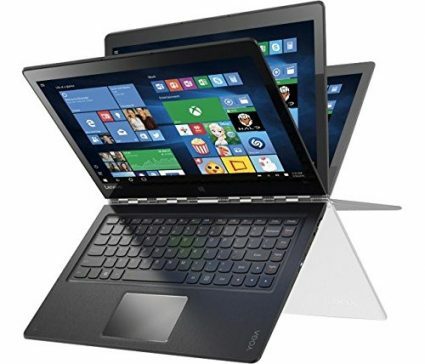 A convertible or a laptop 2-in-1 is so called because of its versatile form, which allows the user to convert it to either a tablet or a laptop. This conversion can be facilitated by either a detachable design where the screen can be removed from the rest of the device, or by 360-degree hinge rotation where the device remains intact. As a laptop manufacturer’s answer to the exponentially increasing competition from tablet makers, convertible and 2-in-1’s have taken the market by storm. From high-end devices to budget and low-range products, the market has it all. With this in mind, we have traveled through the convertible and 2-in-1 universe and ultimately procured a list of the best laptops out there. If you have been yearning for a taste of this hybrid life, this list of laptop tablet hybrids features the creme of the crop 2 in 1 tablets and laptops. If you are looking for a touchscreen but aren’t sure if you need tablet functionality, then our best touchscreen laptops guide has some great alternatives. Our best laptops under $1000 guide also has some great lightweight non 2-in-1 alternatives. Those with a keen eye for detail will want to browse our beginners’ laptop buying guide to get clued up on all the technical jargon before viewing our buying guides in order to prevent you from getting the wrong laptop. First impressions of the Dell XPS 12 9250 are excellent and you clearly see just how well-put together it is. The unit is made from highly refined aluminum-magnesium alloy resulting in a hybrid that is incredibly light, yet solid and durable. With sharp and square edges, the tablet ergonomics don’t quite favor tablet mode. Furthermore, at 12mm thick and weighing 1.6 pounds, holding the tablet for casual one-handed use is not the way to go. Thankfully, using the device as a traditional laptop is an enjoyable experience, especially due to the clever magnetic docking system that lets the screen open and fold flat just like a laptop. And speaking of the screen, magnificent is the right word to describe it. The 12.5-inch display has a 3,840 x 2,160-pixel resolution, which results in acute contrast and colors that positively leap from the screen, and despite the fairly reflective screen, viewing angles are excellent even in the bright outdoors. Connectivity is limited to 2 USB Type-C ports (compatible with Thunderbolt 3) and a MicroSD slot which are all on the tablet, and the dock is nothing more than just a very well-laid out backlit keyboard and trackpad. While the Dell XPS 12 9250 excels on design and display quality, one of its biggest compromises is with performance. While the Intel Core M processor in this unit is the top-end M7-6Y75, it still pales in comparison to the Core “i” processors. Luckily, the 8GB RAM and fast 256GB SSD help keep light to moderate use seamless. What can’t be helped is the battery life, which at 5 hours is nothing but mediocre. Beauty with brains is probably the best way to describe the HP Spectre x360 13-4197ms Signature Edition. This 2-in-1 has a handsome metallic design and elegantly rounded edges that make it scream luxury. Furthermore, you can get one with copper-colored sides and hinges to add to the pomp. At 3.17 pounds, it is heavier than a few of its competitors like the Microsoft Surface Pro 4 which is helped by having a keyboard cover rather than a full base. And speaking of the keyboard, typing is fairly comfortable, although the keys will seem a bit flat if you are used to typing on more traditional keyboards. Thankfully, backlighting is present for low-light typing, and the touchpad is spacious enough. The Spectre x360’s display is nothing less than gorgeous. With a 2560 x 1440-pixel resolution, colors are highly accurate and images are well detailed. Additionally, the audio is loud and clear, making this a top-notch multimedia device. Under the hood, this unit sports the power-efficient and reliable Intel Core i7-6500U, 8GB RAM and a 256GB SSD, providing more than enough performance for work and entertainment. While we won’t recommend for heavy gaming, the on-board Intel HD Graphics 520 will do well with light to moderate 3D games, as well as moderately demanding graphics software. On Laptop Mag’s battery test, the Spectre x360’s battery lasted an impressive 9 hours which is comfortably on top of the competition. 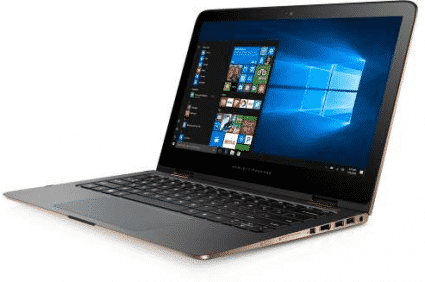 The HP Spectre x360 13-4197ms is a beautifully-designed premium hybrid that is well-equipped to give you the best everyday Windows 10 experience possible. If you are looking for a 2-in-1, this here is an excellent choice. 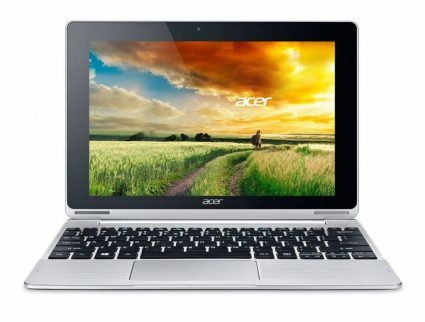 The Acer Aspire Switch 10 SW5-015 is a convertible hybrid released by Acer in early 2016. It garnered significant praise for its decent build quality and excellent design, especially regarding its multimode user functionality. Many customers expressed appreciation on the device’s portability, particularly due to a compact 10.1-inch screen. On the other hand, many reviewers saw the 64GB SSD storage space as rather modest. Critics also had a go at the performance, particularly the 2GB RAM, which is lower than the agreeable 4GB average for budget laptops. All in all, the Acer Aspire Switch 10 SW5-015 is a decent hybrid that will get day to day work done while both in and out of the workplace. Its shortcomings aside, the Acer Aspire Switch 10 SW5-015 is a lovely budget-friendly device for both your everyday tablet and laptop needs. At first glance, the ASUS ZenBook Flip UX360CA will strike you as just another high-end ultrabook with a premium price tag. Yet even with its fair price tag, Asus have added 360-degree functionality for transformation into tablet mode. With a highly polished aluminum casing, the ZenBook Flip is superbly designed. At only 13.9mm thick and weighing a little below 3 pounds, carrying it around is a joy. Perhaps the most appealing aspect of this device is its Full-HD 13.3-inch touchscreen, which boasts accurate colors and is very responsive. That said, typing on the keyboard is not as pleasant as we would hope particularly due to inadequate spacing between keys and lack of backlighting for low-light situations. The selection of USB ports is generous, with 2 USB 3.0 Type-A ports and one USB Type-C (5 Gbps). Audio from the two 1.6 W speakers is will probably not be enough to fill a conference room but is clear enough for casual use. 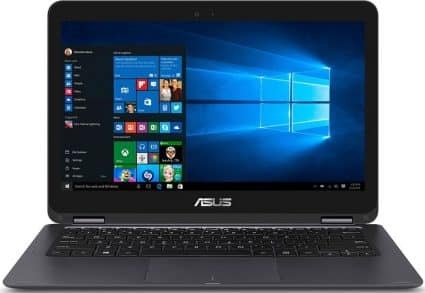 Based on a 6th generation dual-core Intel Core M3-6Y30 CPU, 8GB RAM, integrated Intel HD 515 graphics and turbo mode with SpeedShift multitasking, the Zenbook Flip offers excellent performance for everyday document processing, photo and video editing, web browsing and other productive needs. You can even stretch the device further with some light gaming and it won’t break a sweat. The 512GB SSD is adequate considering most units in its price range come with a 256GB SSD at best. A fan-less design and power-efficient CPU make for an impressive 12 hours before the unit asks for a power outlet. Samsung’s Galaxy Pro S’ tablet design puts it up some very stiff competition: Microsoft’s Surface Pro, let’s see how it fares. 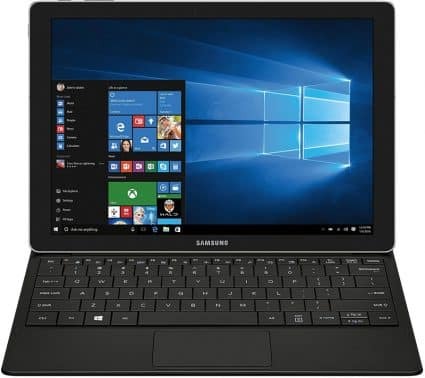 The Galaxy Pro is a full-time tablet and part-time laptop, and as such, it is extremely slim and super light, beating out the Surface in both counts. However, it does not have an integrated kickstand like the Surface, requiring you to snap it into the (included) keyboard cover if you need to use it at your desk without holding it. It also only allows the screen to be viewed from two angles. The keyboard itself has shallow keys that are not spaced out; typing is nowhere near pleasing. Samsung opted for the Intel Core M3-6Y30 processor on this device, and while it will handle normal day tasks with ease, other devices with i5s and i7s will run rings around it in most tasks. This, however, does mean that the Pro S lasts a staggering 10 hours on a single charge, a good 4 hours longer than the Surface Pro. Being Super AMOLED, the 12-inch 1440p touchscreen display is absolutely flawless; it is bright, crisp, and offers accurate and vivid colors at even the tightest of angles. The Pro S might have a few drawbacks, but it overall does an excellent job at providing a Windows tablet experience, and its included keyboard cover makes it a good deal cheaper than the Surface Pro. Packing an advanced display, long battery life and a durable keyboard cover, the Tab Pro S offers a satisfying Windows tablet experience for a reasonable price. The Lenovo Yoga 900 is truly a sight to behold, and backed up with an extensive list of features; it is not all looks. Made of magnesium on the top and bottom, and leather-textured plastic on the keyboard deck, the Yoga 900 looks and feels premium. Other laptops simply cannot compete with the 2.8-pound super light design, and it is thin and compact too. This is especially important for 2-in-1s as you expect to hold them comfortably in one hand in tablet mode. Facilitating the various modes is Lenovo’s sleek 360 watchband hinge design, that comes in different colors to match your tastes. The laptop can operate in different modes; from a traditional laptop mode to a tablet mode. The 13.3-inch 3200 x 1800 touchscreen display is simply amazing; it is super sharp with vibrant colors, and even though it could be a little bit brighter, it provides an overall pleasing viewing experience. Performance-wise, it is very snappy, and trades blows with the rest of them. With a Skylake i7 processor, 16GB of RAM and a 512GB hard drive, your programs will have a tough time making it sweat. The Intel HD 520 has impressive performance for integrated graphics, but alas, you still won’t be able to play newer games on this. Battery life comes to around 8 hours, shorter than most 2-in-1s, but it still lasts a full day, complementing its portable convertible design. This super portable, thin and beautiful laptop is perfect for users on the go who want to take their productivity to the next level. The Inspiron i7359-8404SLV is Dell’s latest 13.3-inch convertible in the Inspiron 13 range of products. It is cased in a charcoal-gray and silver chassis which gives it a sleek premium style. The dual hinge enables you to conveniently flip the screen around for both touchscreen tablet mode and traditional laptop use. Measuring 0.75 inches and weighing 3.7 pounds, the Inspiron is neither the slimmest nor lightest in the bunch, but is still portable enough to hold and walk around with for short periods of time. The 1080p IPS screen appears bright and clear. Both images and text output is crisp and colors are accurate. Additionally, sound output is remarkable, making this an all-around excellent multimedia device. Unlike many similar 2-in-1s, wired connectivity is adequate with 2 USB 3.0 ports, a USB 2.0 port and a HDMI port around the system’s sides. Inside, the Dell Inspiron i7359-8404SLV is equipped with a 2.5GHz 6th generation Intel Core i7-6500U, 8GB RAM and a fast 256GB SSD to offer remarkable performance and smooth multitasking for everyday use. The integrated Intel HD Graphics 520 do well with video rendering and light gaming, but as expected struggles with intense 3D titles. At about 8 hours with moderate to heavy use, the battery life is decent. The Dell Inspiron i7359-8404SLV is a well-built beautiful 2-in-1 that packs some pretty impressive components and features, making it a must have in your hybrids shortlist. 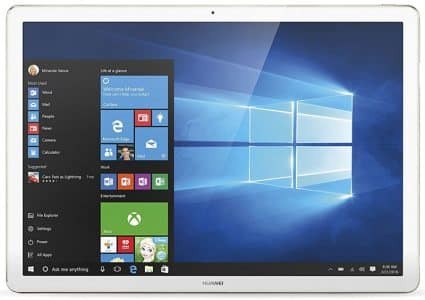 The Huawei MateBook’s tablet design makes Surface Pro comparisons inevitable. Just like the Surface Pro 4, it incorporates an Intel Core M series processor and a magnetically attached keyboard that comes separately. The processor, along with 8GB of RAM and a 512GB SSD, runs all everyday computing tasks with ease, do not expect to run newer games, however. The device is extremely thin and light, with a full aluminum back and glass front; it looks and feels great. Huawei’s Portfolio keyboard is stylish, converts the tablet into a 2-in-1, and acts as a protective case. It, however, falls short where it counts; its keys are shallow with no spacing in between them, making accidental key presses an occasional occurrence. It cannot compare with the keyboard on the Galaxy Pro S, and especially not Microsoft’s Type Cover keyboard. The 12-inch 1440p IPS touchscreen display offers a rich, colorful viewing experience at even the narrowest of angles. It is also bright enough for use in direct sunlight, but it truly shines indoors. Huawei’s Matebook offers a lot for what you pay. Its slim design, however, reduces ports to a USB-C and headphone jack, and its battery does not last that long; key areas where its competitors have an edge. Though the Huawei Matebook’s battery life could be better, its super portable design, vibrant screen, and solid performance make it a great Windows tablet for personal and office tasks. The Toshiba Satellite Radius 12’s name has a long list of superlative adjectives that come before it, but perhaps its most impressive feat is cramming a 4K display into a compact, lightweight frame. Its dark brushed metal design looks sleek, and its light and compact design allows it to be tucked away neatly in a briefcase. Its 360 hinges allow use in various modes, and it is comfortable to hold in tablet mode. 4K resolution on a 12.5-inch screen is nothing to scoff at; with its high pixel density, it offers some of the sharpest images you will see on any screen. Colors are incredibly vibrant and accurate as compared to other devices, and its high contrast brings out all the details in dark movie scenes with unprecedented clarity. It is no slouch either; with an Intel Skylake i7 at its heart, coupled with 8GB RAM and a 256GB SSD, the Radius 12 is speedy, responsive, and will shrug off any task you throw at it. Older games play much better on the new generation of Intel’s integrated graphics, but don’t expect acceptable settings on newer games. The backlit keyboard could offer more key travel, but it gets the job done. The touchpad is large and responsive, but its positioning to the left causes your left palm to brush up on it while typing. The device has a wide array of ports offering a healthy serving of connectivity options. Despite its short battery life, the Satellite Radius offers a great and affordable 2-in-1 experience with its powerful specs and stellar 4K display. With the Pavilion X2 12-B020NR, HP promises world something that is even better than their highly acclaimed earlier model, the HP Pavilion X2 10-k077nr. From a casual glance, the X2 12 might strike you as just a bigger version of its 10-inch predecessor, but underlain are some major changes. For starters, the chassis is now almost entirely wrapped in metal rather than plastic and because of this, the Pavilion X2 12 feels like a more premium device. Additionally, being larger than the original has resulted in a thinner product, measuring only 0.33-inches thick as a tablet and 0.62-inches with the keyboard attached. However, weighing 3.23 pounds, it is pretty heavy even for a 13-inch laptop. Other than being larger than its 10.1-inch sibling, the display on this device is sharper. Thanks to a 1080p Full-HD panel, colors are very accurate and both picture and text appears crisp. Viewing angles are also impressive so don’t be afraid to take your X2 out in the sun. The keyboard is now stretched out and the keys are well-spaced to ensure maximum comfort while typing, and the wide track-pad has been expanded to match the larger screen. 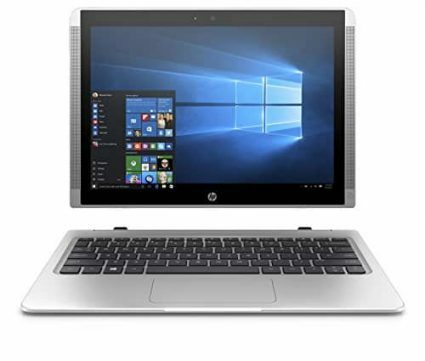 Performance-wise, he HP Pavilion X2 12 comes with a 6th generation Intel Core M CPU, 4GB RAM and 128GB SSD storage space, which is an impressive feature set given the machine’s price tag. While a 9-hour battery life might be regarded as average for a 2-in-1 given today’s high standards, it is still enough to last you a whole day away from the power outlet. With an elegant design, a very impressive new screen, decent performance and an agreeable price, it is hard to go wrong with the HP Pavilion X2 12-B020NR. When it comes to convertible laptops, the Yoga line is among the best on the market. The Lenovo Yoga 710 features a lightweight aluminum design that not only looks brilliant, but it will also withstand the abuse of travelling or college. 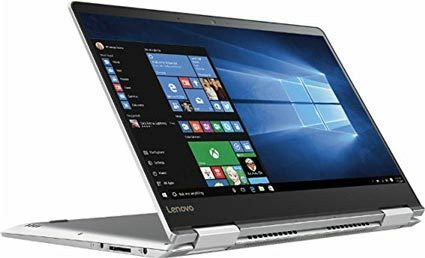 To keep the Yoga 710 as thin as possible, Lenovo have not included an optical drive and you will have to purchase an external drive if you need to use CD’s or DVD’s. This is not really a deal breaker as most media and apps can be found online these days. 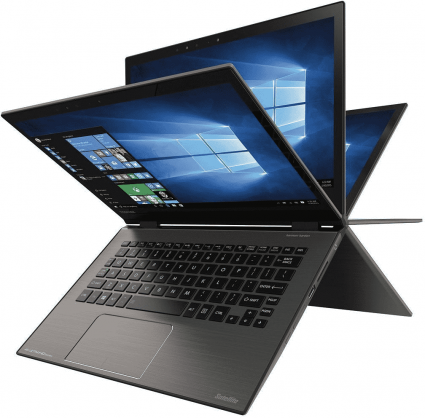 The Lenovo Yoga 710 features a Kaby Lake-based Intel Core i5-7200U processor and 8GB of DDR4 2133MHz RAM, which will offer good performance for everyday tasks and will even be able to handle more intensive photo and video editing apps. The Lenovo Yoga 710 also features a super fast solid state drive that will allow you to boot into Windows in seconds and offers far better performance than standard laptop hard drives. While the 256GB of storage space is enough for work and college files, it can fill up quickly if you intend on storing a large amount of multimedia files. The display offers rich colors and great viewing angles thanks to its In-plane switching technology. The display also offers support for multi-touch interaction and is very responsive when navigating around Windows or your favorite web browser. The display also features a 360 degree hinge that will allow you to convert the Lenovo Yoga 710 into a tablet style PC in a matter of seconds. 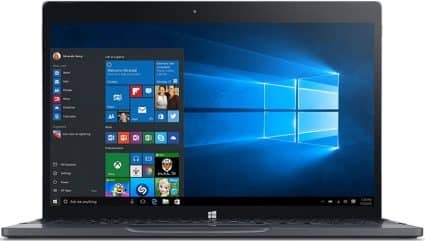 But if you want to connect the Lenovo Yoga 710 to your HDTV, then you will have to purchase an adapter as it does not feature a full size HDMI port. 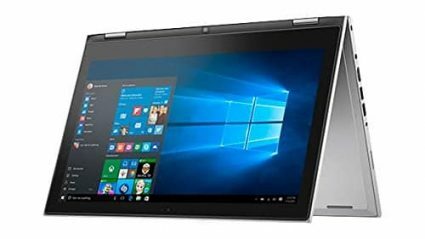 The Lenovo Yoga 710 is a thin and light convertible laptop that offers decent hardware and great battery life for travelling professionals or college students. However the Lenovo Yoga 710 only offers two USB ports and a Micro HDMI port. After years of development and teething issues with the first Surface Pro’s, Microsoft has finally gotten the winning formula with the Surface Pro 4. 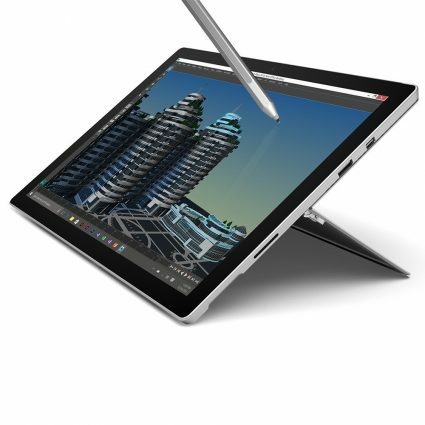 The Microsoft Surface Pro 4 SU3-00001 is the most powerful tablet PC on the market. 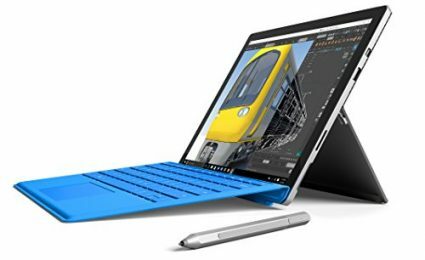 Microsoft understands that users on the go require a device that will allow them to work long hours and the Microsoft Surface Pro 4 offers an impressive 9 hours off of a single charge. The powerful Intel Core i7-6650U processor is backed by 16GB of Ram and will make light work of any business task that you can throw at it. The 1TB solid state drive offers lightning fast Windows boot and app loading times and ample storage space for all your work and multimedia files. The crystal clear display offers wide viewing angles and rich and accurate colors, but has an unusual 3:2 aspect ratio. With a 100% sRGB color coverage and a touch and digitizer pen interface, the Surface Pro 4 can be used for design tasks and also allows artists to create beautiful artworks in Photoshop and Illustrator. To make sure that users have full control of all that Windows 10 has to offer, Microsoft has preloaded the Surface Book with Windows 10 Professional. This allows for more control of features that are catered towards business professionals in the corporate workspace. The Microsoft Surface Pro 4 SU3-00001 is a high-end tablet PC with powerful hardware for the work space, but the high price could put some users off. That rounds out our list of the best convertible and 2-in-1’s. We are confident that you will find the best laptop for your needs right here. Of course, if you would prefer to do more research, you could also visit our other guides including our best laptops under $500 and best cheap laptops Under $400 guides. Also, if you prefer something a little more high end, we’d suggest taking a look at our best gaming laptops under $1000 and best high end laptop guides. Do You Need a Two-in-one? The clear answer is YES if you expect to carry around the PC quite often which may prove a bit problematic with a traditional laptop. I’m rather confident that you’d be happy with the 2-in-1 laptop because it offers the convenience of a tablet and the high performance of a laptop, allowing you to accomplish most tasks on the go. They also tend to be kinder to your wallet. What Screen Size Do I Need? If you need a device that is easy to toss in a bag and carry to class, then a 12-inch screen will do you just fine. But for presentations and watching movies, a larger screen is recommended. Also, consider which type would best suit your needs out of detachable and rotating-hinge types. The general consensus is to go for the detachable kind if you won’t be doing a lot of typing and the rotating-hinge type if you expect a lot of typing and touchpad navigation. Finally, you need to get a laptop with the right features to do the job. The best 2-in-1s have either the Intel Core i7 or m7. The difference between the two is that m7s sacrifice a bit of processing power in exchange for longer battery life. But if you’re on a tight budget, then a Core i3, i5, m3, or m5 would still prove effective. For RAM, choose 4GB or 8GB depending on your budget. Then top it off with sufficient storage if you can afford a few more bucks. For a lower budget, traditional HDDs are still quite effective.